The Count's Arms is the upper class drinking establishment of Anvil, located in the west part of the city. 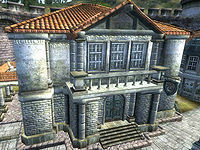 It is found across the road from Pinarus Inventius' House and next to Quill-Weave's House and Arvena Thelas' House. The publican, Wilbur, will buy potions and food while only selling the latter. He is also widely recognized in the city as having a deep knowledge of wines. The ground floor consists of a bar, dining room and a small reading room to the right while the rooms are upstairs. The second floor of the inn, "The Counts Arms Private Rooms", consists of five rooms: one single, one twin and three doubles. One of the doubles ("Up the stairs there and then directly across the hallway", as Wilbur describes it) is the one you can rent. It is spacious and well lit, with an upper-class double bed, chest of drawers and a dining table with food and wine. All of the other rooms are well-locked and none of the beds are free to sleep in, as entering is considered trespassing. During the Where Spirits Have Lease quest the former owner of Benirus Manor, Velwyn Benirus, can be found in the inn's ground floor. Jesan Sextius is currently in Wilbur's employ, as he himself admits, but will offer no services of any kind. A handbill advertising the inn reads: "The beds at the Count's Arms are the softest in Anvil. We wash them after every third customer, no matter how soiled. Our pillows are twice as soft as those at the Flowing Bowl." Esta página foi modificada pela última vez à(s) 02h32min de 7 de junho de 2013.